WE HAVE PASSED the 4pm weather warning deadline and people are being told to stay indoors until tomorrow afternoon. 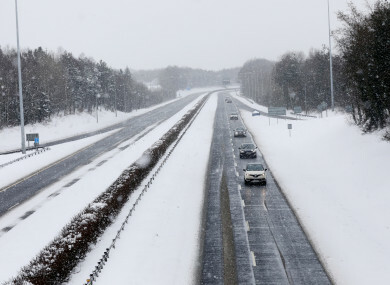 For anyone thinking of venturing out in their car, Boston native Seán O’Neill, of Transport Infrastructure Ireland, suggests they take heed of the fact that even in a US city where there is huge investment in infrastructure around snow and blizzard conditions, most people there take weather warnings very seriously. “What happens sometimes is people have big 4x4s and think they are all that and a bag of chips,” he told TheJournal.ie. “It’s a bit like an airplane when you don’t know where the horizon is, there’s a whiteout and you can’t see properly. So you have 4x4s driving off bridges and motorways and that’s a danger then for others who come to rescue them. Anyone who thinks they have a great vehicle, no matter how experienced a driver you are, even in a tank if you can’t see in front of you, you can go right off a road and you’re putting rescue people at risk, their lives. He said in Boston when a state of emergency is declared and drivers ignore warnings from the authorities, there can be “serious consequences”. “State troopers will throw you in the the clink or you won’t see your car again,” he explained. Email “'In Boston they'd throw you in the clink': Here's why you should never drive in a blizzard ”. Feedback on “'In Boston they'd throw you in the clink': Here's why you should never drive in a blizzard ”.